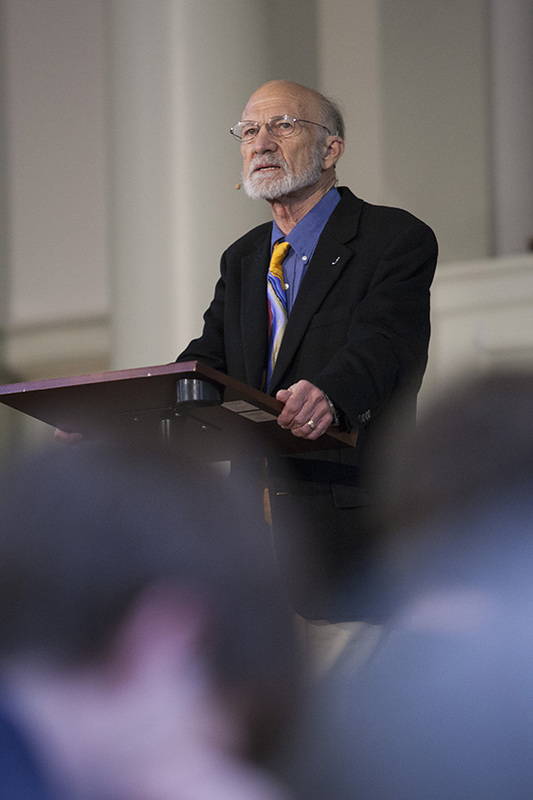 Against the backdrop of Holy Week, ethicist Stanley Hauerwas explored the history of war in both religion and society and proclaimed that an alternative for the Christian is not a more adequate ethic for conducting war, but worship. "The church does not so much have a plan or a policy to make war less horrible or to end war; rather, the church is the alternative to the sacrifice of war in a war-weary world," he said. "The church is the end of war." Dr. Hauerwas (left) delivered the Andrew Gerow Hodges Lecture sponsored by Samford University's Frances Marlin Mann Center for Ethics and Leadership April 15 at Samford. Hauerwas is the Gilbert T. Rowe Professor of Theological Ethics at the Divinity School of Duke University. In his lecture entitled "Sacrificing the Sacrifices of War," Hauerwas spoke of the moral practice of war but refused to acknowledge war to be a good thing. Rather, quoting theologian James McClendon, he noted that "powerful practices" can be narrated through the New Testament understanding of "principalities and powers" to be "all the more dangerous because they can be perversions of God's good creation." Hauerwas suggested that no matter how hard one works, either the pacifist or just war options, it makes little difference for the actual practice of war. "Sentimental appeals to peace too often turn out to be the grounds to justify the judgment that even if war is horrible and/or terrifying, sometimes we must be willing to kill," he said. Also, he maintained that the greatest sacrifice of war is not the sacrifice of life, as horrible as that is, but the sacrifice of our unwillingness to kill. "To kill, in war or in any circumstance, creates a silence," he said. Remarking that war veterans seldom talk about the experiences of battle, Hauerwas suggested that killing shatters speech, ends communication and isolates us into different worlds whose differences we cannot even acknowledge. "Even more cruelly," he said. "we expect those that have killed to return to normalcy." Americans, he noted, have rarely bled, sacrificed or died for Christianity or any other sectarian faith, but have often bled, sacrificed and died for their country, which should be a clue to the church. "This is a sobering judgment, but one that cannot be ignored if Christians are to speak truthfully to ourselves and our neighbors about war," he said. "Christians, however, must insist that what is true is not what a society thinks is worth killing for, but rather that for which they think it is worth dying." Suggesting that to be a reason why the church is waning in American today, Hauerwas said, "If Christians leave the Eucharistic table ready to kill one another, we not only eat and drink judgment on ourselves, but we rob the world of the witness necessary for the world to know there is an alternative to the sacrifices or war." Earlier, Hauerwas participated in a panel discussion hosted by the Frances Marlin Mann Center for Ethics and Leadership, on the subject of virtue ethics. Hauerwas' primary intent in teaching is to show that theological convictions make no sense unless they are actually embodied in one's life. Identified by TIME magazine as the greatest theologian in America, he also works in medical ethics, issues of war and peace, and the care of the mentally handicapped. Samford Provost Brad Creed asked Hauerwas several questions before providing the audience an opportunity to quiz the guest. Suggesting that ethics is a subject gaining traction in the Samford curriculum, Hauerwas was asked to define virtue ethics. He provided several examples from history, including Aristotle, and suggested that a life well lived is a life of complete virtue. The decisions one makes moment by moment and day to day based on honesty and courage is a virtuous life. He acknowledged that institutions such as Samford and their relationship to a church should stress trust. "Donors give large sums of money and trust that their commitments will be honored for life," he said. Hauerwas urged the university not to let the current curriculum diffuse its emphasis on Patriarchal texts in favor of more modern histories that deal with the culture rather than the subject of the text. "We need to produce people of eloquence," he said.